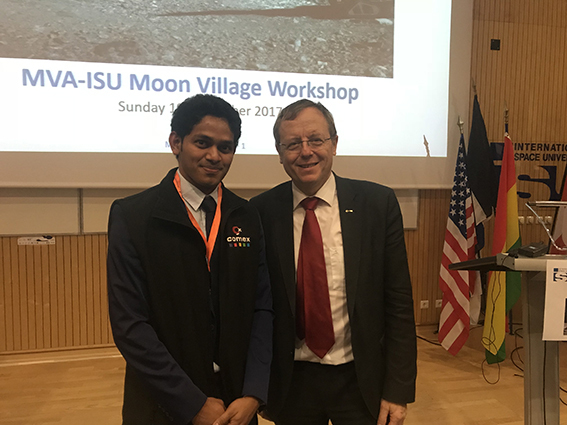 COMEX, partner in the RegoLight consortium, participated in the first Moon Village Association Workshop held at ISU in Strasbourg, France 19.-21. November 2017. The keynote speech for the event was given by ESA Director General Jan Wörner. At the workshop more than 100 delegates from around the world with various field of expertise ranging from engineering, science, law, policy, management, architecture, and the arts came together to identify various items / issues to be considered for the “Technical Framework for the Moon Village”, “Business Opportunities of the Moon Village” and “Coordination & Cultural Aspects of the Moon Village”. The result of the workshop will be consolidated into an integrated Report which will be a key input to the 2nd International Space Exploration Forum (ISEF 2) in Japan (March 2018). The project has received funding from the European Union’s Horizon 2020 Research and Innovation Programme under Grant Agreement no 686202.